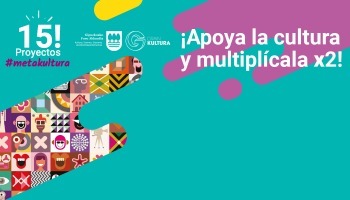 We are pleased to present the twenty selected projects that will be campaigning from 15 September in the context of the last call for matchfunding META!Kultura, promoted by Goteo and the Provincial Council of Gipuzkoa. 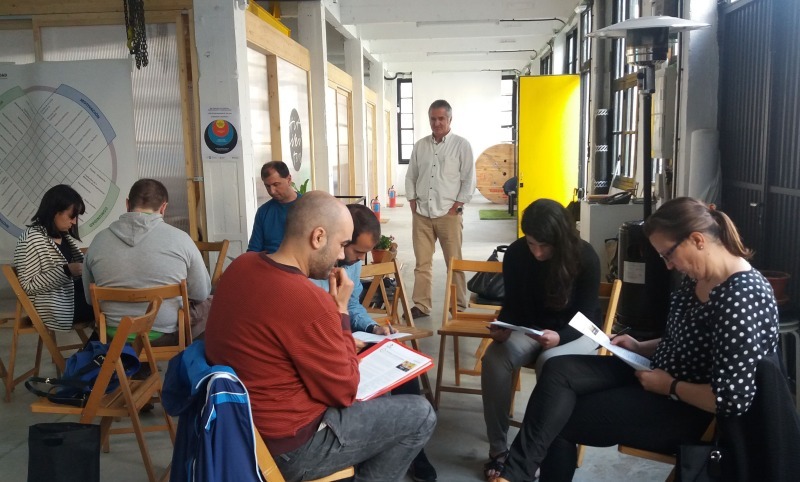 An Assessment Commission has evaluated and selected the most innovative and interesting culture-driven projects based in Gipuzkoa, which seek to involve civil society across the board. We are already conducting workshops in order to launch the campaigns with all the energy we can muster to encourage you to contribute what we call your "multiplier drops" which, together with the help from Provincial Council of Gipuzkoa and a pool of 70,000 euros, will provide resources, visibility and impact so these campaigns can be developed and made available to the whole society. A multidisciplinary show combining theatre, audiovisuals and dance, to address the issue of violence against women. The aim is to raise awareness among the public and stimulate debate in a different way, avoiding clichés. Dj Txanpaina, the king of club culture, records under Creative Commons with the aim of sharing sounds, passion and feelings. He will launch this experience by recording eight new tracks and a percussion intro with three other great artists. Amarenak (“mother” in Basque) recovers the kaiku, a traditional Basque "endangered" garment. It adapts the original pattern to modern taste. 136 dresses will be made by hand in the traditional way in Gipuzkoan workshops in two lots of 68 + 68. The patterns will be open source and garments will be local. With a clear plan for the future, dance group Ametz Bide dreams of its new space. Looking for ways to merge language, culture and leisure through the union of different agents, the group’s ultimate goal is to refurbishing a cultural centre and fill it with activity. The Arkeolan Foundation wants to raise awareness and train students by giving them access to archaeological heritage. To this end it intends to carry out, as a complementary training activity, a small archaeological dig in the garden of the Pio Baroja Secondary School, in Irun, where iron slag (which could be associated with old mining Irun) has been found. García Lorca and Lauaxeta were both executed in the Civil War, but this is not all they have in common. This multicultural play, seeking to recover historical memory will shed light on life, death and the poetic work of these two great. An online network at the service of the arts: a website connecting artist, art centres and the public because connecting artists, making them visible, and allowing the greatest possible number of people to enjoy the arts is essential for the healthy development of culture and society. A project by the Gipuzkoa Association of Historians summarizing the history of Gipuzkoa, updating it and breaking with old myths and clichés. Six experts provide a fresh look at the territory from prehistory to the present day, with hitherto unpublished documentation. Is there a relationship between the Basque language and the bicycle? Can the bicycle bring about social change? Biziki will try to answer these and other questions, in a living process that will be developed in two stages: first, interviews, while cycling, with four Gipuzkoan experts on mobility, economy, feminism and the Basque language, and second with a creation process that will culminate with an exhibition of photographs on the International Car Free Day. Entertainment and commitment are at the heart of this traveling exhibition, based in Donostia, which aims to give visibility to "invisible" cinema. It will give new audiences access to short and medium-length films while filmmakers and authors can show their works in alternative spaces. The aim is to provide technological sovereignty to more people, with a complete, compact unit that can be transported anywhere in the world to carry out design tasks, scanning and 3D printing, laser cutting and pyrography. Moreover, the mini "factory" can easily be replicated thanks to the CC-BY-SA license on its documents. Since 2013 this intercultural event, which features mostly local musicians, raises funds for the people in Djembering (Senegal), where three volunteers from Osakidetza are working. The proceeds will be used to pay musicians and volunteers, and also support the project, if the optimum is reached. A performance about the role of death in the West, focusing on three aspects: the stage experience, contents from The Tibetan Book of Living and Dying, and audiovisual documentary projections. A work that opens a door to life. An album inspired by Hesse’s work Steppenwolf, aims to delve into concepts and feelings, by combining of different artistic expressions. Three guitars, three voices, drums and bass will give substance to experimentation with the sounds of literature. With the subtitle "longest, largest and most popular", this campaign asks for support in organising the fifth Bang Bang Zinema season. This will take place in June 2017 and is sure to be more participatory, more summery and more amazing than ever. Environmental awareness through cultural work: a gallery with downloadable high quality images shows the beauty and value of coastal natural resources of the Gipuzkoa coast, corner by corner, in order to raise awareness, promote their respect and work for their preservation. 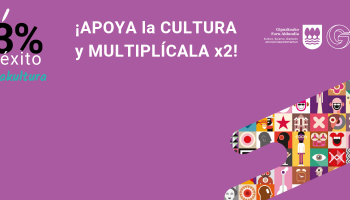 Creating and publicising the "meme" community in Basque, this project aims to contribute towards standardisation, use and development of this language. A website will be launched to publish and circulate memes. Moreover, a contest will be organised to encourage participation, both in creating these resources and voting on them. An interactive, mobile tale: the Shagu pet will transport and tell the tale in hospitals, shelters and educational spaces to promote values like tolerance, friendship and generosity through a story about the childhood disease. The idea is to recover unused pianos with which to "flood" Donostia, and thereby respond to the lack of public pianos. It all began with an idea of Dani, a youth from Amara who plays every day at the TABA cafeteria and social space in Tabakalera. He wants to give access to music and encourage more liveable and friendly urban spaces. What do we mean by a good death? What can we do to make this possible? Mandalara Taldea suggests a training programme to create social awareness and work on comprehensive palliative care (where physical, emotional, cognitive and spiritual aspects are taken into account).